When the team behind Deborah Milano asked me to review a lipstick for them, I jumped at the chance. After choosing a gorgeous red shade in Luminous Red, or Shade 12, I did some research into the brand. Straight from Italy, Deborah Milano stock all the products you need from skin care down to your nails. With plenty of different products to choose from, they offer a great range of colours to suit any mood or occasion. When receiving this pretty shade of red, I was intrigued. I usually stayed away from glosses and matte lips are usually a staple look for me, but I was incredibly surprised with how much I enjoyed this lipstick. With the perfect amount of shine, this shade is perfect for the summer. It gives my lips a gentle glossy colour which isn't too bold, but can be built up for a more intense colour, or alternatively, muted down. I was over the moon with the formula, glides on like a dream and stays put throughout the day with the occasional top ups. It's smooth feeling on the lips and not at all sticky, which usually steers me away from any glossy lipsticks. 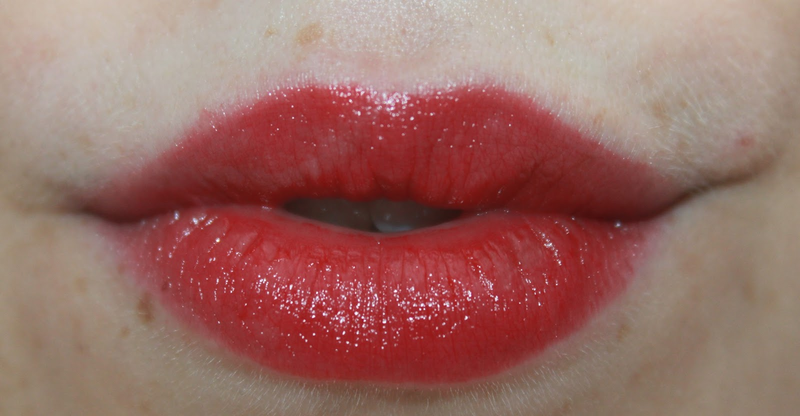 The lipstick itself has a subtle sweet smell to it which is barely there when applied, and also has no taste. I also love the little vine-like logo on the top of the bullet, as seen below. Overall, I am very, very pleased. The pink see-through packaging is pleasing on the eye, and has a summer feel about it. Perfect to throw in my hand bag as it's so easy to apply - even without a mirror. This is without a doubt my new beach lip shade. Grab yours on the Deborah Milano website for £7.50*. Choose from a wide range of colours to find the perfect one for you. That's a really pretty shade. I like the glossy finish too.